Beautifully-updated, modern, furnished studio unit for sale at the Arts Condominium! This unit has an upgraded kitchen with full-size stainless steel refrigerator, white Shaker style cabinets, and a granite countertop with 2-burner cooktop. The stunning bathroom has a tiled walk-in shower with a convenient sliding glass door. The updated vanity, light fixture, and black fixtures are accented by clean, classic, white subway tile that wraps around the entire bathroom. A white penny round mosaic tile floor completes this space. The barn door entrance saves space and adds to the modern feel of this unit. The living area has a ceiling fan, dark flooring, neutral gray and white walls, and beautiful tall white baseboard moulding. This unit comes furnished with all furniture shown in the photos. ALL UTILITIES are included in the monthly condo fee (water, heat, electricity, air conditioning, basic cable & HBO)! This building has laundry facilities, a fitness center, a bike storage room, and a community room in the basement. Other perks include a 24/7 lobby attendant, secured entry doors for the building, and wireless internet in the lobby. This unit would be great to live in, or as an investment property or pied-~-terre! The Arts Condominium is centrally located with super-convenient access to the subway~s Broad Street Line, as well as the PATCO line. 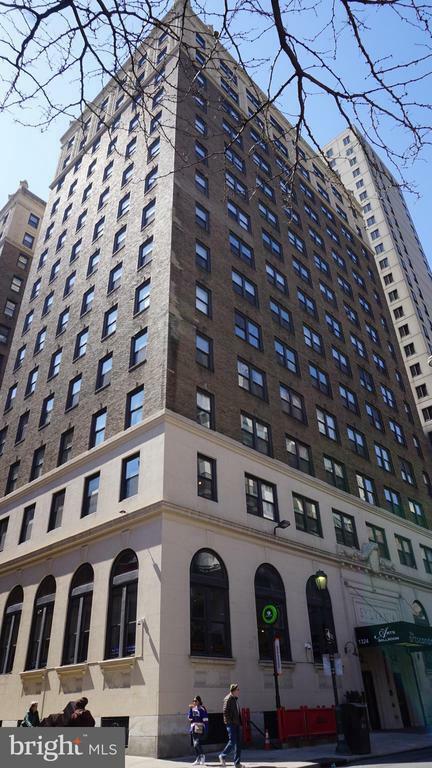 Located between the Avenue of the Arts and Midtown Village, this unit is close to restaurants, theaters, shopping, the Academy of Music, Kimmel Center, University of the Arts, Thomas Jefferson University Hospital, Pennsylvania Hospital, City Hall, and so much more! Furnished items included with sale are: 50" LG HDTV, Casper Queen Mattress, Floyd Platform Bed, Mitchell Gold + Bob Williams Lounge Chair, Two Laundry Cards, Bike Room Storage Tag and Key, and Freight Elevator Key.